Tonight Keith and I went out to dinner. We paid the same entrance price as everyone else in the place, but we ended up sitting on pieces of cardboard on the floor and sharing a bowl of rice and beans that we ate with our fingers. We got jipped you say? Far from it. Tonight was the 20th annual BYU Hunger Banquet. If Hunger Banquet sounds a bit like an oxymoron, let me explain. 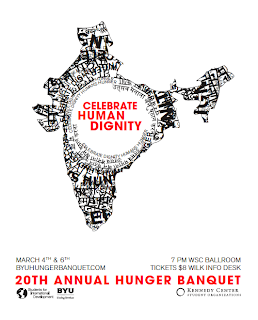 The Hunger Banquet is an evening of entertainment, a wonderful keynote speaker, and a dinner game all focused around bringing awareness to the problem of inequality and poverty that surrounds us. The game goes like this: our world is roughly composed of three groups, 10% is high class, 20% is middle class, and 70% is poor. Everyone who bought a ticket to the Hunger Banquet is randomly divided into these groups with the same percentages. There were a few that dined at decorated tables with lavish meals, a few more that sat at chairs with a modest one-course meal, and the rest of ate as Keith and I did. We didn't get full, and I was very thirsty, but our minds were overflowing. -We need to look for a calling, not just a career. The only way we can take BYU's goal (enter to learn, go forth to serve) seriously is if we choose an occupation in life that will not only aid ourselves and our families, but communities. -We are not as separated from these problems as we think. Look around. - Those whom we think of as helpless and destitute have hopes and dignity. We need to serve them in a way that preserves that dignity. -By staying debt free we are enabled to make life decisions based on service, not on our pocketbook. P.S. For those of you in the Provo area there the Hunger banquet will be done again this Saturday. Go. You will be entertained and enlightened. Katie, I loved this. It really made me think. You and Keith really are amazing. And on a side note, whenever I see a patch of sunlight in a room I think of you.